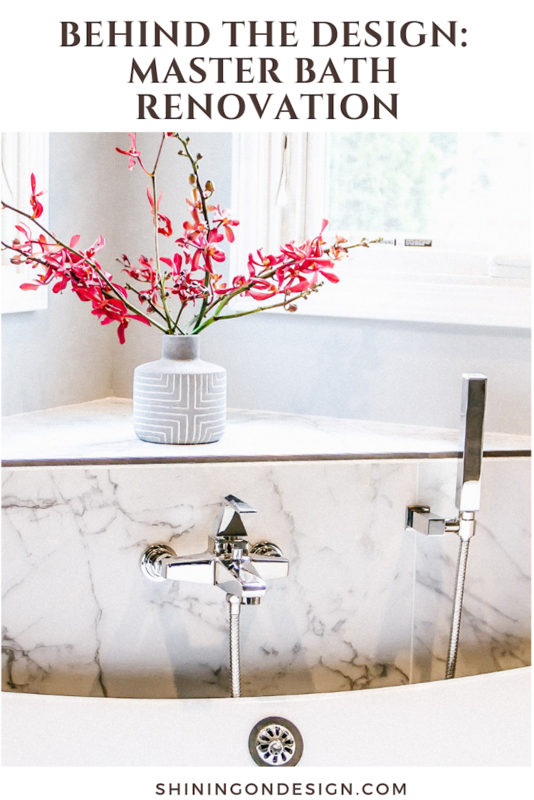 I’m excited to share my client’s master bathroom renovation! 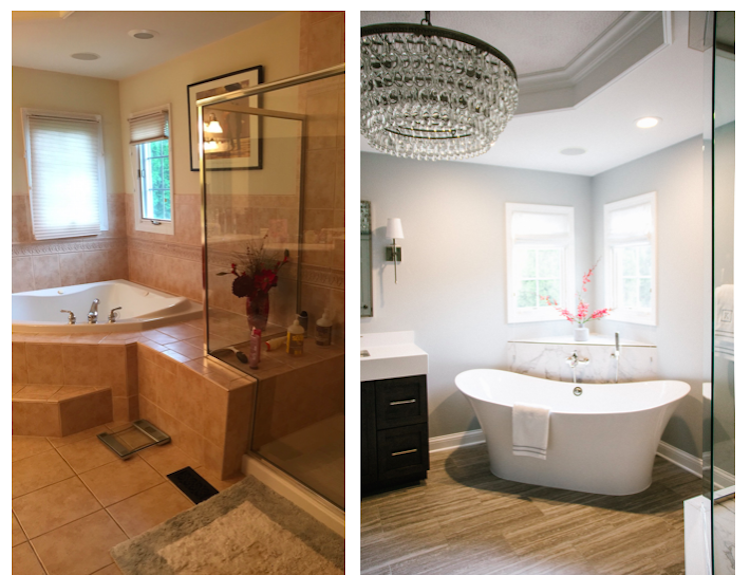 I’ve shared their family room redesign in Elmhurst and love working with this family. 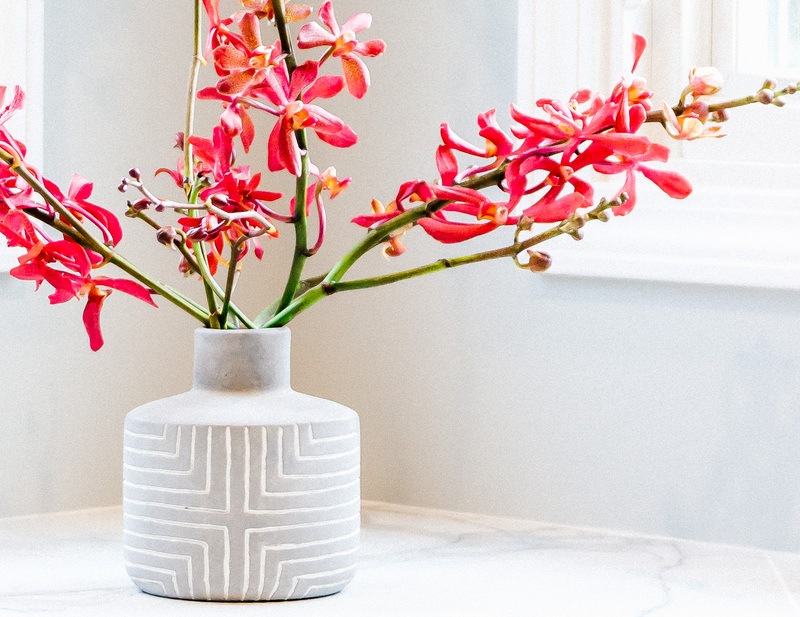 We are transforming spaces throughout their entire home so stay tuned for more! 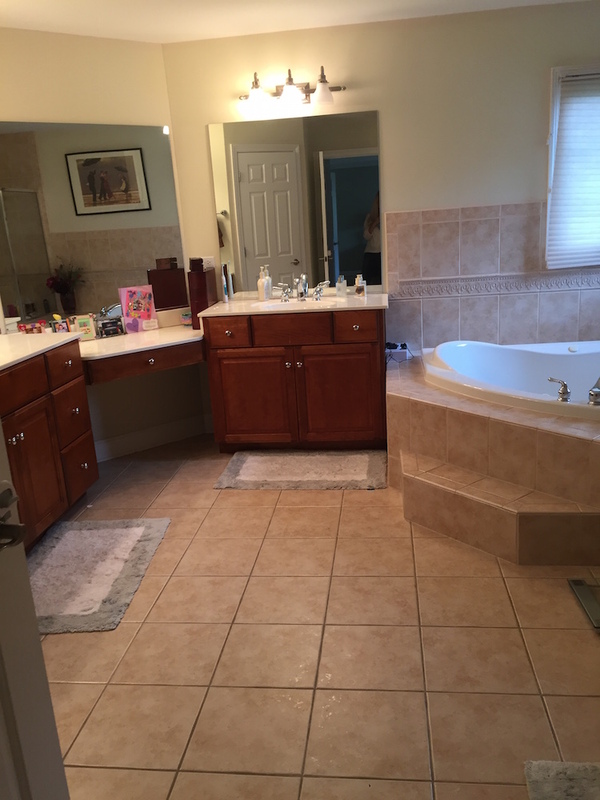 Today, I’m sharing before & after photos of their master bathroom. 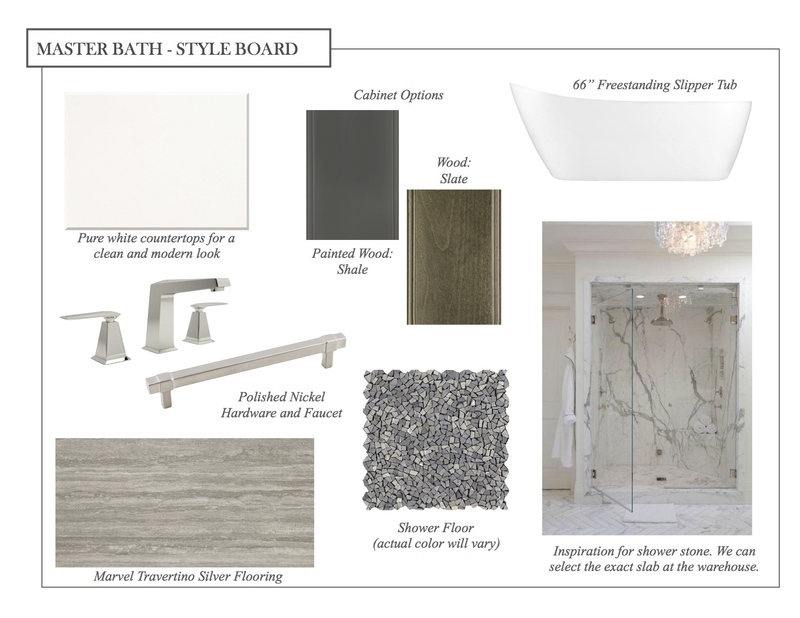 I’m ALSO sharing some peeks into the design process and what a style board may look like if you work with me. Your feedback is always welcome in the comments! Also, if you caught my instagram stories today, I announced the winner for the Legrand giveaway!!! Do you want more of these type of giveaways?! Do tell! 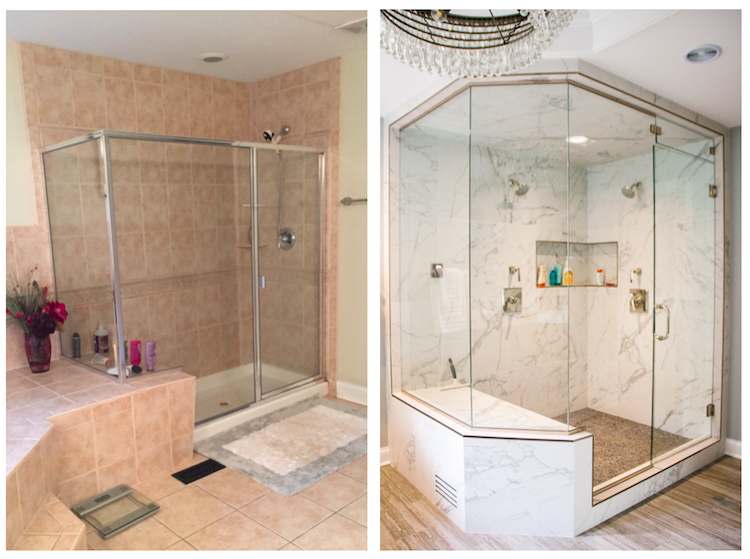 I loved working with Legrand on this post to upgrade your home and excited to partner with them again on projects. What you can’t see in this photo is the shower which is located to the right when you walk in. The glamorous toilet room is to the left for those curious ;.) We did not have much flexibility with the layout. 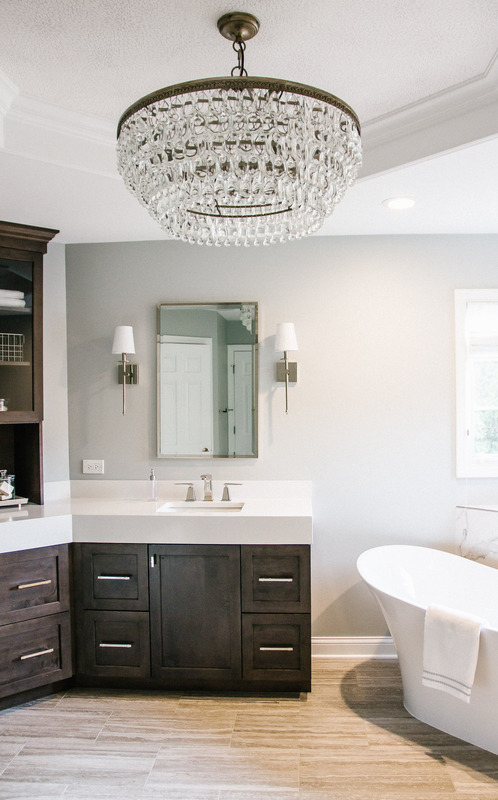 My goal was to update the bathroom with nice finishes, gorgeous lighting and a beautiful tub. I’ve tried to be better about sharing the process of before and afters so I’ll give details in this post about the design process too.. 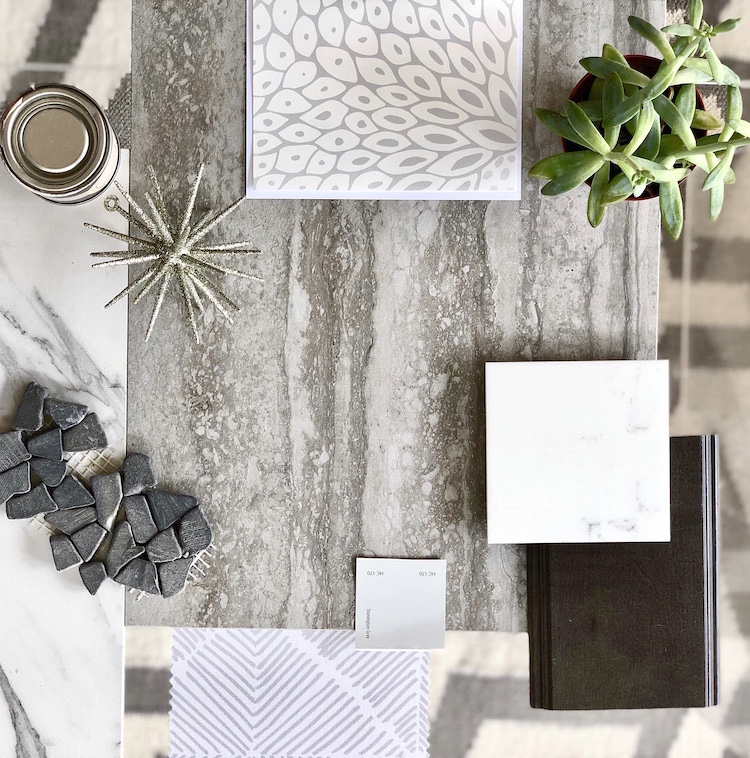 Above is the design board presented to my client, along with samples of the finishes so they could see what most pieces looked like in real life. You can never really tell a true color looking at a computer screen or print out! I’ve worked with this client for awhile now and was thrilled when they gave everything a thumbs up on round one! Hooray! The only thing we switched was that we used a double slipper tub vs. slipper tub. With this design, either the wood cabinets or painted cabinets would work. Given the two options, my clients decided on the wood finish (which looks fantastic in person!). After the finishes were selected, we finalized lighting and window treatments. The shades are from The Shade Store and when closed, still let some light in while providing privacy. 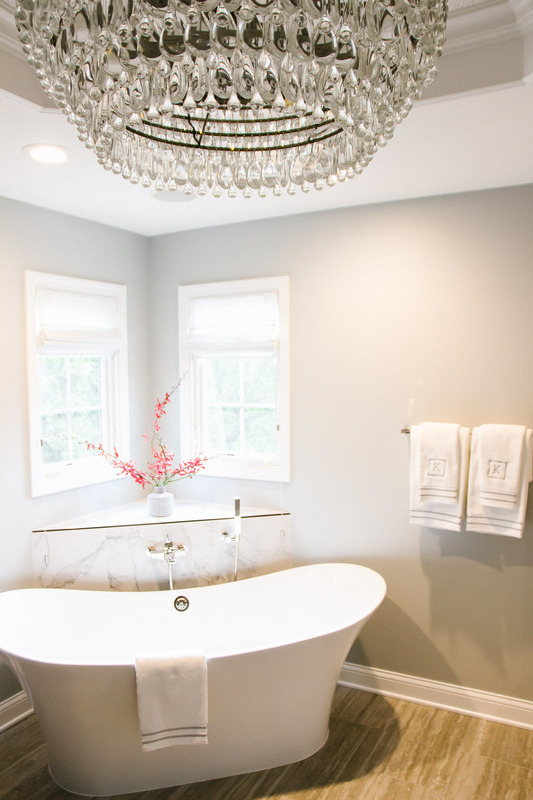 One of my favorite parts of this bathroom renovation is what we did with the tray ceiling. 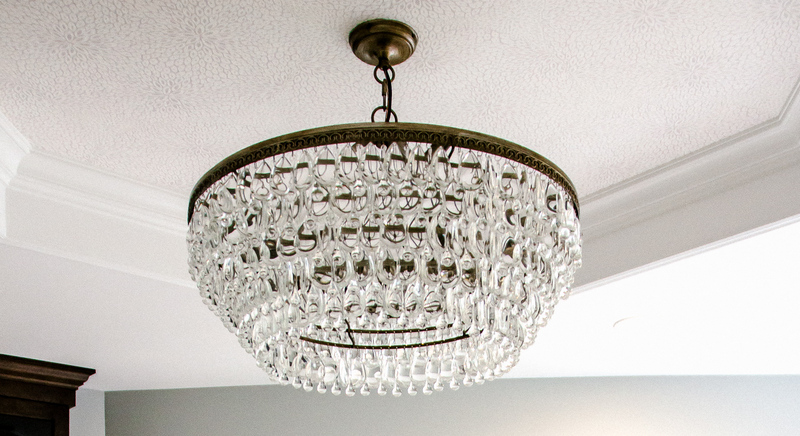 I love fabulous lighting and this chandelier is definitely a statement piece! 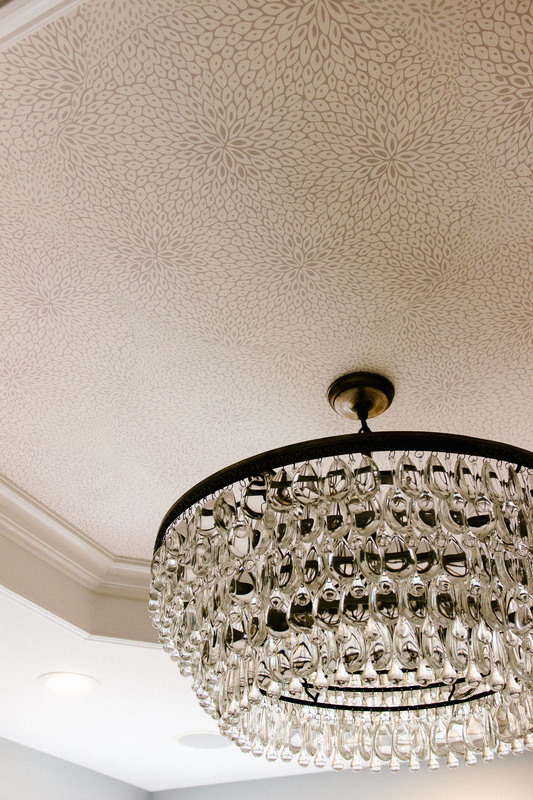 To highlight the chandelier even further, and add another design element, we wallpapered the inside of the tray ceiling. The wallpaper from Serena and Lily is a beautiful and subtle print which adds interest without taking away from the chandelier. The chandelier is stunning in real life! 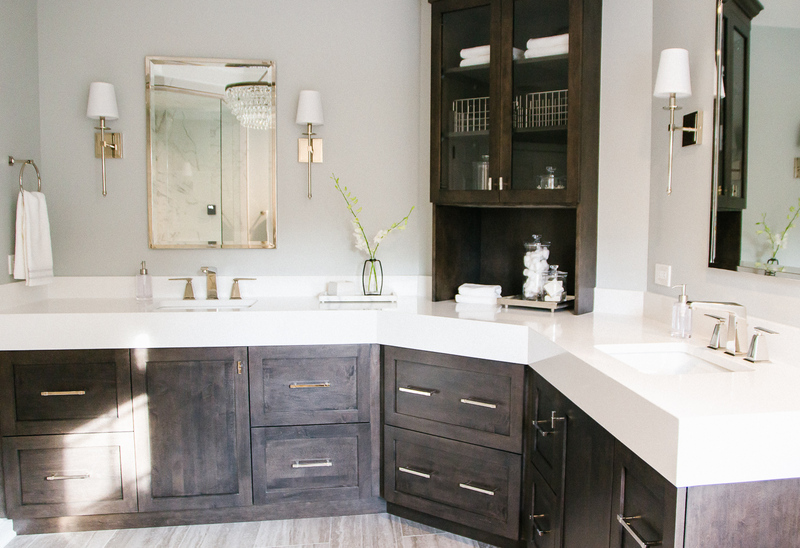 I’m glad we went with the natural wood finish for the cabinetry. 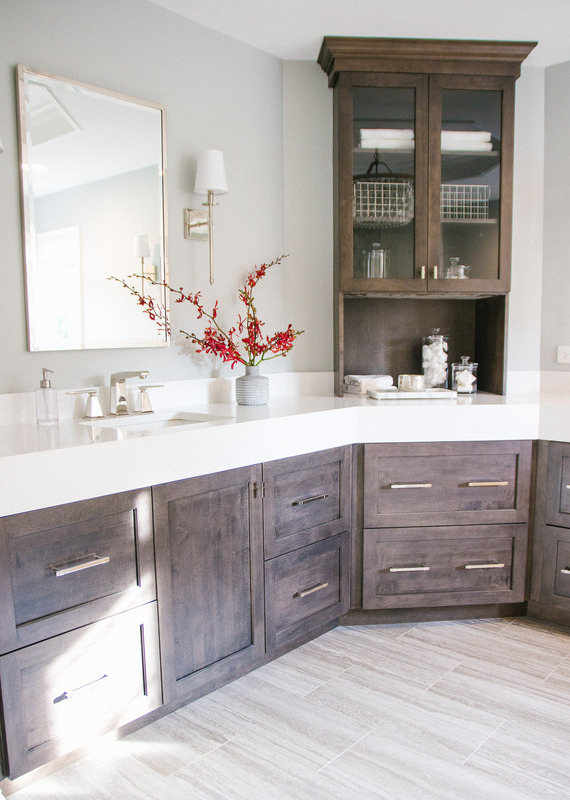 Either the painted option or the wood would have looked great but honestly, if you are removing and adding new cabinets this is the way to go! 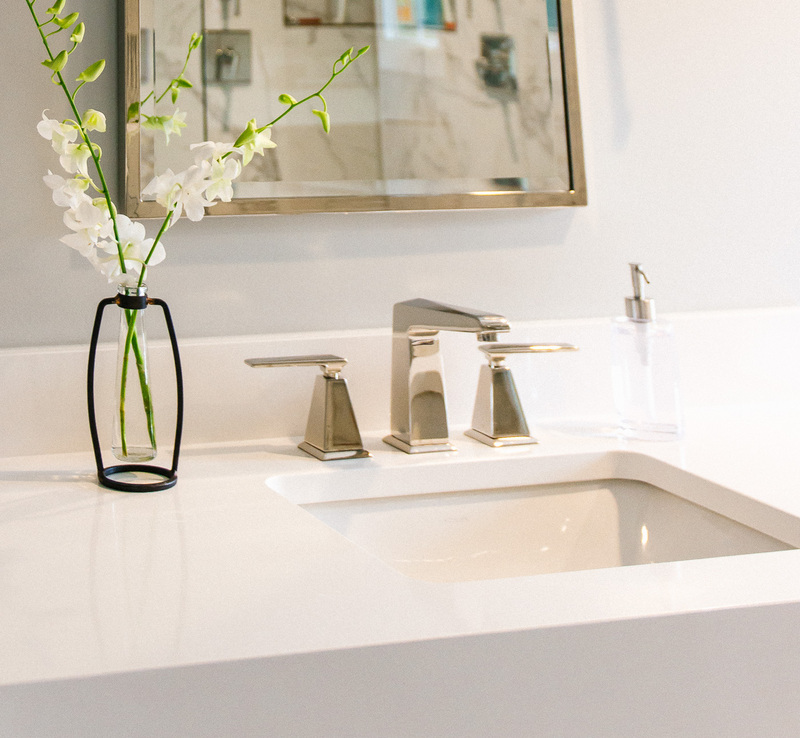 The thick, white quartz countertop was a must for the beginning. 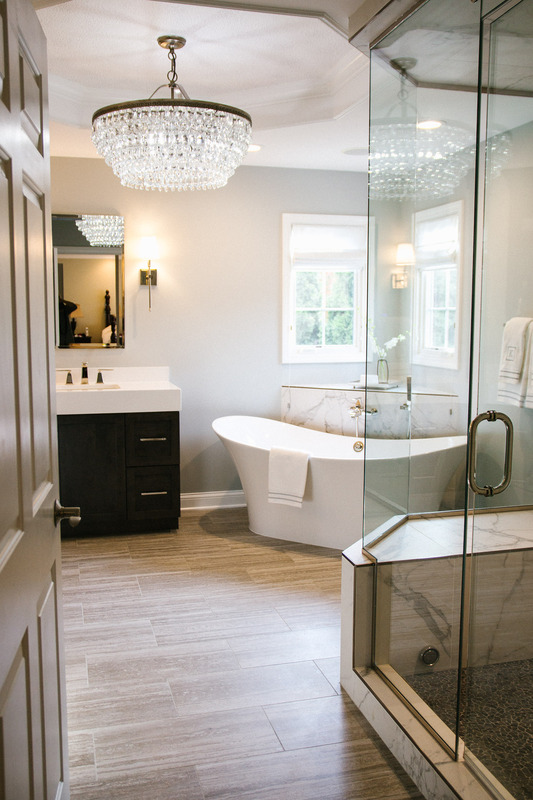 We used a few traditional and modern elements in this bathroom. The sconces are another favorite piece! Monogram towels are linked above! 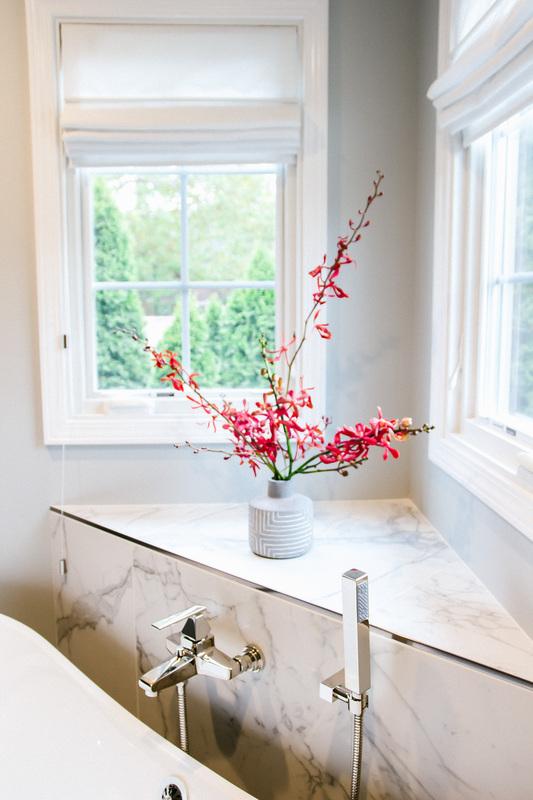 One thing that many people don’t realize up front with renovations is that they take time. 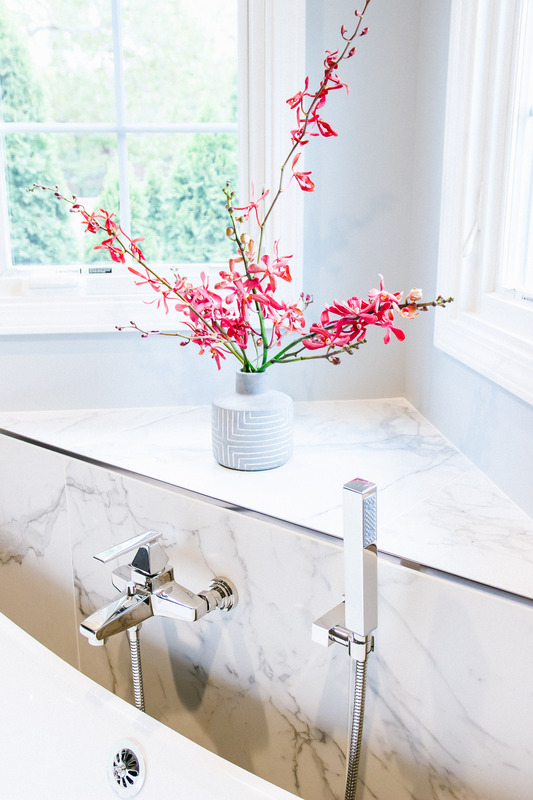 I’m excited to get to work on another bathroom renovation for a client who happens to live down the street from this client’s home! Beautifully done Samantha! 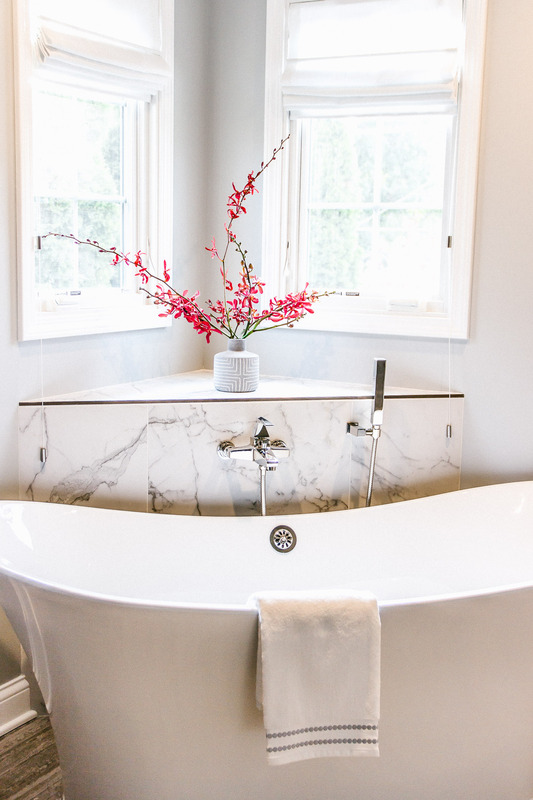 I love the marble and gorgeous bathtub. Very creative with the wallpaper. Can you tell me how much you needed to order for the tray ceiling? Thank you! We only needed to order 1 roll for the ceiling! Wow! What a transformation, love it! Can you provide the company/source for the flooring? It was from Virginia Tile – I’d have to check the exact name but they carry it!